An undergraduate student’s technique for detecting certain metabolites in urine samples could lead to a simpler and more accurate way to test for prostate cancer. Treating samples with a special enzyme, S&T undergraduate student Casey Burton discovered that the greater the concentration of the metabolite sarcosine, the less the samples fluoresced, or glowed, under ultraviolet light. Developed by Casey Burton of Lake Ozark, Mo., a senior chemistry major at Missouri University of Science and Technology, the technique also could prove to be less expensive than conventional prostate-specific antigen (PSA) testing for prostate cancer. That is because Burton’s technique does not require the use of high-tech instrumentation often used to detect metabolites. Instead, his technique relies on a simple chemical reaction as well as diagnostic equipment that is available in most health clinics. Burton also believes his approach would be more accurate than PSA tests, which “cannot accurately differentiate between benign prostate conditions and active prostate cancer,” Burton writes in a recent research article published in the journal Analytical Methods. “This lack of sufficient diagnostic techniques for prostate cancer highlights the need for more effective screening methods,” he writes in his paper, “A novel enzymatic technique for determination of sarcosine in urine samples.” The paper was published in Analytical Methods, Vol. 4, 141, in January 2012. In the journal article, Burton explains how treating urine samples with a certain enzyme can determine the concentration of the metabolite sarcosine. Enzymes interact with a substrate, or molecule, to cause a chemical reaction that can be measured through various analytical techniques. Until recently, the presence of sarcosine in urine was thought to be linked to prostate cancer, but that correlation has been refuted, Burton says. Even so, his method for detecting the presence of sarcosine could be used to test for the presence of other metabolites that may be linked to various diseases. The enzyme he used is one of a broad class of enzymes that operate similarly on molecules like amino acids and nucleic acids, among others. Using the enzyme sarcosine oxidase on the samples produced the chemical compound formaldehyde. Through oxidation, the formaldehyde in turn produced formic acid. From this series of chemical reactions, Burton was able to determine how much sarcosine was in each sample by examining the levels of fluorescence after the enzyme treatment. 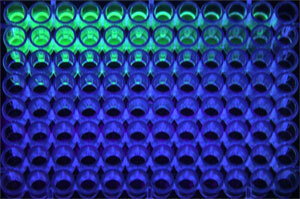 The more the samples fluoresced, or glowed, the lower the level of sarcosine. Conversely, a decrease in fluorescence from the samples indicated a higher level of sarcosine. Burton validated his method with nine urine samples. 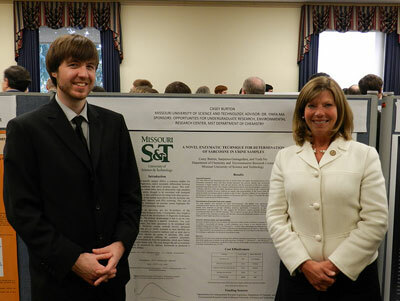 S&T student Casey Burton met with U.S. Rep. Jo Ann Emerson, whose district includes Missouri S&T, during an April 2012 Council on Undergraduate Research meeting in Washington, D.C.
Burton’s method may be applied to other metabolites that may be linked to prostate cancer, he says. But the greatest value of his process may be its ease of use. The system’s low cost when compared to traditional PSA tests is also a plus, Burton says. “This costs a tenth of a penny per sample, compared with the $70 or so it costs to get a PSA test at a health clinic or doctor’s office,” he says. 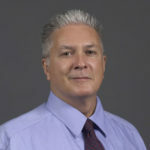 Burton works with Dr. Yinfa Ma, a Curators’ Teaching professor of chemistry at Missouri S&T and creator of an instrument, called the P-scan, which can be used to screen urine for oncopterine and six other pteridine biomarkers. Oncopterine exists only in the urine of cancer patients. Ma and Sanjeewa Gamagedara, who recently graduated from Missouri S&T in 2012 with a Ph. D. in chemistry, co-authored the Analytical Methods article with Burton. Burton’s research is supported through the S&T chemistry department and the university’s Opportunities for Undergraduate Research Experience program as well as the Environmental Research Center. Earlier this year, Burton was one of 74 undergraduates chosen by the Council on Undergraduate Research to discuss their research with lawmakers and policymakers in Washington, D.C. During that trip, Burton met with U.S. Rep. Jo Ann Emerson, whose 8th congressional district includes Rolla and Missouri S&T.